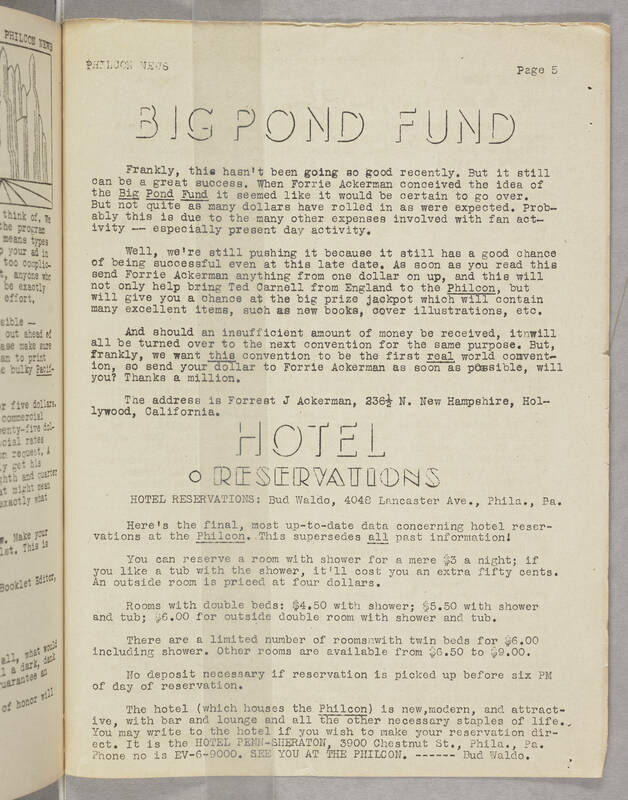 PHILCON NEWS Page 5 BIG POND FUND Frankly, this hasn't been going so good recently. But it still can be a great success. When Forrie Ackerman conceived the idea of the Big Pond Fund it seemed like it would be certain to go over. But not quite as many dollars have rolled in as were expected. Probably this is due to the many other expenses involved with fan activity -- especially present day activity. Well, we're still pushing it because it still has a good chance of being successful even at this late date. As soon as you read this send Forrie Ackerman anything from one dollar on up, and this will not only help bring Ted Carnell from England to the Philcon, but will give you a chance at the big prize jackpot which will contain many excellent items, such as new books, cover illustrations, etc. And should an insufficient amount of money be received, it will all be turned over to the next convention for the same purpose. But, frankly, we want this convention to be the first real world convention, so send your dollar to Forrie Ackerman as soon as possible, will you? Thanks a million. The address is Forrest J Ackerman, 236 1/2 N. New Hampshire, Hollywood, California. HOTEL RESERVATIONS HOTEL RESERVATIONS: Bud Waldo, 4048 Lancaster Ave., Phila., Pa. Here's the final, most up-to-date data concerning hotel reservations at the Philcon. This supersedes all past information! You can reserve a room with shower for a mere $3 a night; if you like a tub with the shower, it'll cost you an extra fifty cents. An outside room is priced at four dollars. Rooms with double beds: $4.50 with shower; $5.50 with shower and tub; $6.00 for outside double room with shower and tub. There are a limited number of rooms with twin beds for $6.00 including shower. Other rooms are available from $6.50 to $9.00. No deposit necessary if reservation is picked up before six PM of day of reservation. The hotel (which houses the Philcon) is new, modern, and attractive, with bar and lounge and all the other necessary staples of life. You may write to the hotel if you wish to make your reservation direct. It is the HOTEL PENN-SHERATON, 3900 Chestnut St., Phila., Pa. Phone is EV-6-9000. SEE YOU AT THE PHILCON. ------ Bud Waldo.